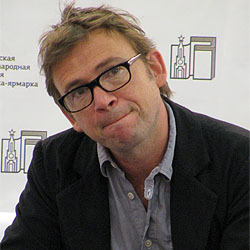 David Nicholls is a screenwriter, as well as the author of four novels including bestsellers Starter For Ten and One Day, both of which have been adapted for the screen. One Day has sold 5 million copies around the world and is published in over 40 languages. David’s latest novel, Us, was longlisted for the Man Booker Prize and in the year that it was published (2014) he was named UK Author of the Year at the National Book Awards. David worked as an actor before moving into script-editing for theatre, radio and TV, His first produced screenplay was an adaptation of Sam Shepard’s play Simpatico. He then worked in British TV for several years, writing episodes of Cold Feet as well as original series Rescue Me and I Saw You. As a scriptwriter for TV, David’s credits include adaptations of Tess of the d’Urbervilles and original contemporary drama The 7.39, all for the BBC. As well as his own novels, David has adapted Blake Morrison’s memoir, And When Did You Last See Your Father?, starring Jim Broadbent and Colin Firth, Dickens’ Great Expectations with Ralph Fiennes and Helena Bonham-Carter and the 2015 adaptation of Hardy’s Far from the Madding Crowd, featuring Carey Mulligan. He has been nominated for a BAFTA three times, as Best Newcomer, for his work on Cold Feet and for the BBC single drama Shakespeare Retold – Much Ado About Nothing. His most recent work is Patrick Melrose, a five-part adaptation of Edward St. Aubyn’s novels, Patrick Melrose, starring Benedict Cumberbatch, Jennifer Jason-Leigh and Hugo Weaving. The serial has been nominated for five Primetime Emmy awards.